Facing the Arabian Sea on the west, Alappuzha, also known as Alleppey, was founded in 1762 by Raja Keshawadasan, Divan of Travanacore. Today the town is the administrative headquarters of the same named district in the state of Kerala. The stunning natural beauty of Alappuzha earned it the epithet of "The Venice of the East" by English Governor General Lord Curzon. Beautiful lakes, lagoons and fresh water rivers are interspersed along the stretch of coastline at Alappuzha. The place is also home to an impressive animal and bird life. A famous backwater tourist center, Alappuzha is known for its boat races, houseboat holidays, beaches, marine products and coir industry. 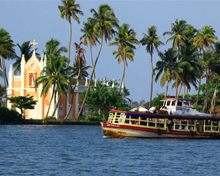 Apart from the natural attractions Alappuzha is also a prime destination for religious tourism. The Poomkavu Church is a sacred destination for Christian Pilgrims. Other renowned religious centres in and around Alappuzha are Mannarasala Temple, Mullackal Raja Rajeshwari Temple and Salafi Juma Masjid Mosque. That said, Alappuzha's wide array of travel attractions ensures that you will find yourself in the pleasant predicament of selecting which one to focus your attention on in this surreal destination in God's own country. 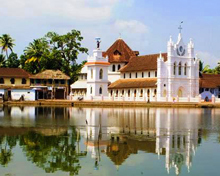 If you are religious minded and history buff, head towards Karumadi which is three km away from Alappuzha. The place is known for the 11th century black granite statue of the Buddha, known as Karumadikuttan. Pathiramanal (sands of midnight) is a beautiful island which is natural habitat for more than 90 local species and attracts several rare migratory birds from different parts of the world. Pintail ducks, Indian pond heron, stork-billed kingfisher are some of them. Located in the Vembanad Lake between Kumarakom and Thaneermukkom, Pathiramanal can be reached by boat. One of the highlights of a trip to Alappuzha is the Krishnapuram Palace located at Karthikappally in Kayamkulam. Built by Anizham Thirunal Marthanda Varma in the 18th century, the palace is known for the largest mural in Kerala which depicts the story of Gajendra Moksham. The Archaeological museum housed in the Krishnapuram Palace has a collection of antique stone and wood sculptures, copies of Mural paintings, coins and bronze objects. Alappuzha Beach is an ideal place for the picnickers. The 1,000-ft long pier called as Kadal Palam (Sea Bridge) dates back to the 19th century. The 150-year-old lighthouse also fascinates those visiting the beach to have close look of nature in all her beauty. 64 km from Alappuzha, Kochi is the convenient airport connected by flights from major cities of India. Alappuzha is a major railway station connecting several important cities. Good motorable roads also connect the place with different places in India.